It may not be easy to print from your iPhone, iPod touch, or iPad, but it can be done—provided you seek out the help of a third-party app. But which one should you turn to for help? Here’s a look at three apps vying to assist you with all your mobile printing needs. Under My Thumb(nail): PrinterShare’s print preview screen displays thumbnail views of all pages of your document, and provides some control over printing options. PrinterShare is an awkward app to set up; besides installing it on your Mac, you also have to register an account. After that, on your Mac, you have to specify which printer (or printers) you want to share, whether you want to hide your printer from search results (more on this in a moment), find the remote printer as registered online, select the printer (which is now displayed in two panes of the main Mac application window, and then configure the printer (paper size, “notify me on job completion,” encrypt or not, and so on). In addition, a third window appears when you click on the Mac application’s “incoming” button, and that provides you with a variety of options, including setting default permissions (automatically download and print from approved users, wait for approval, remove, and so forth). This all makes sense, in a way, because PrinterShare is designed to enable you to print remotely, over the Web, and to allow multiple users to print to the same machine remotely. (For example, employees can all remotely print to a shared printer.) However, there’s no apparent option for simply printing over a local network. And although you can choose to hide your printer from search results (when you are searching for a printer from the iPhone app), it seems that the only way for users to find their own printer is to make it public and find it; then, once that’s done, they can hide it from search results. It’s a confusing process, in part because developer Dynamix Software attempts to protect users from having their printers hijacked by unknown users. It seems, however, that the first option should simply enable you to link your iPhone to your printer by using your user ID, and that “searching” for printers should be a secondary option (because it would probably be unnecessary for most users). You’ve Got Options: ePrint’s home screen displays several extra features not included in other printing apps—the ability to create and print custom cards and calendar pages using your photos. PrinterShare lets you print photos, contacts, Web pages, and the contents of your iPhone’s clipboard. The results are not bad, but far from perfect: you have no control over the font size on Web pages, so the results may turn out to be difficult, if not impossible, to read because the resulting printout uses too small a font size. You must type in the URL you want to print every time; you can’t save or bookmark pages you want to print frequently. In addition, the app is prone to crashing and freezing; when I tried to print my contacts, the app froze every time, and took several attempts to restart properly. PrinterShare version 1.3.1 is compatible with the iPad; the iPad version takes advantage of the entire screen in standard iPad resolution, and works in exactly the same fashion on the iPad as it does on the iPhone. 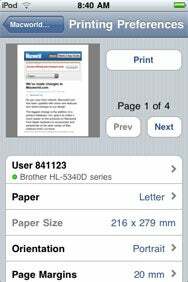 ePrint from Microtech is an excellent app that enables you to print from your iPhone to printers connected to your local area network. It’s an elegant offering, which you configure on your iPhone by adding a printer that the app can detect using Bonjour; you can also type in the printer’s IP address. 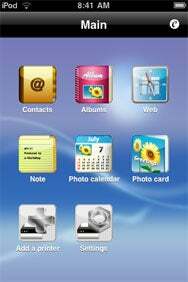 The app does a superb job of printing readable Web pages, and it allows you to save bookmarks and even organize them into folders. In a nice touch, the app saves your browsing history, which can come in very handy if you’ve forgotten to bookmark a page that you later decide you want to print. More Screen Space: ePrint uses the iPad’s generous screen real estate to offer beautiful, large-scale previews of documents before printing, in this case a calendar page. ePrint enables you to also print cards and calendar pages using photos stored in your iPhone library, print notes you take within the app, and print a list of selected contacts. When you select Print from any of the modules, you’re presented with a standard, elegant print settings screen that displays page previews (in thumbnail form that you can examine more closely by tapping on the image, which then expands to fill the iPhone screen). The settings screen also offers a variety of paper size and layout choices. The app is also stable and fast: there’s little delay in printing requested documents. 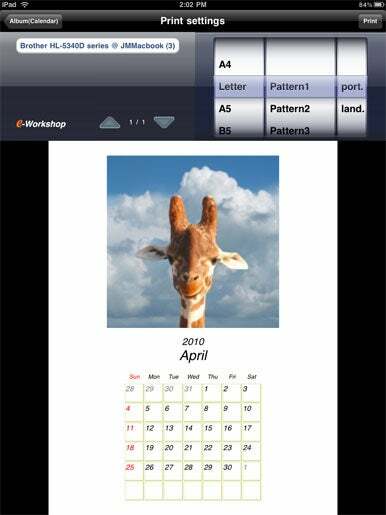 ePrint 3.3 is iPad compatible, and works identically to the iPhone version. Like PrinterShare, it also uses the full resolution of the iPad screen to provide better views and easier navigation on the big screen. Ready, Set, Print: DocPrinter’s print preview page enables you to select the number of copies you want printed and specify a page range for printing. It also supports duplex printing. DocPrinter is one of more than a half-dozen printer apps offered by EuroSmartz; it’s also one of the developer’s more versatile offerings. DocPrinter enables you to download and print documents from FTP, WebDAV, iDisk accounts, and a folder you specify via the Mac-hosted WePrint server. You can e-mail Web pages, photos, and documents from within DocPrinter, although the app does not enable you to receive e-mail. It does allow you to e-mail, export, move, rename, and even create zip files of your shared folder documents, powerful functions for this type of app. You also have the capability to use DocPrinter as a virtual hard drive, setting it up via your Mac as a network device. The app performed well in a test printing from a Google Docs account, and did an excellent job of importing from my Mac and subsequently printing a complex PDF file. Picture Perfect: DocPrinter’s iPad display provides an excellent, high-resolution preview of documents to be printed. DocPrinter also enables you to select contacts you want to print, and allows you to choose whether you want them printed in list or card form. You can print (or save as documents) photos, Web pages, contacts and contact lists, and documents you’ve downloaded from one of your Web or FTP accounts, or from your Mac’s specified folder. Printer options are also impressive, as you can choose a page range to print from, and, if you have a duplex printer, you can choose duplex printing as well. DocPrinter is a strong offering from EuroSmartz, but it comes at a relatively high price. 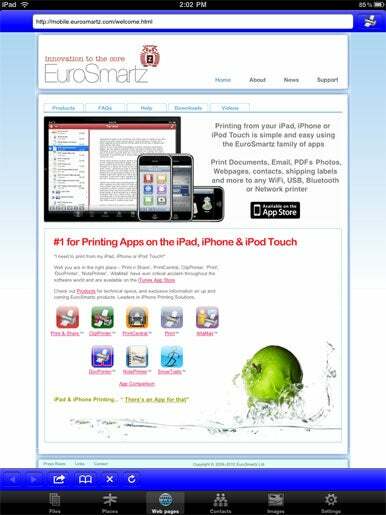 It’s also worth noting that other EuroSmartz apps have some iPhone printing capabilities that DocPrinter does not offer, such as printing e-mail. Setting up the app to work with your networked printer and Mac, which is necessary for you to use all of DocPrinter’s functions, is fairly straightforward, and EuroSmartz offers well-organized and well-written help instructions at its Web site. DocPrinter 2.2 acts like the other printing apps in this review in that it’s a hybrid app that runs on the iPad. While it takes advantage of the entire iPad screen, DocPrinter works the same in iPad form as it does on the iPhone.